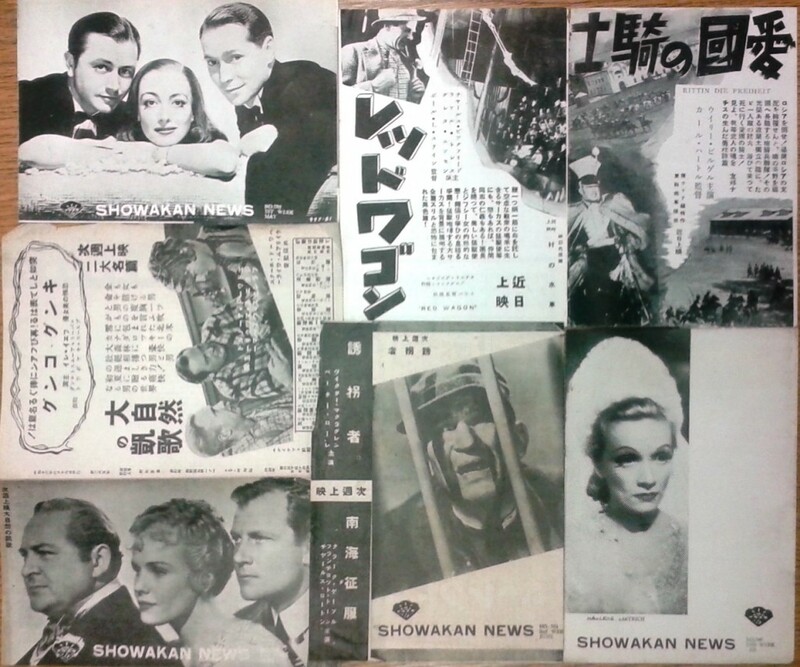 Playbill ephemera or what I refer to as handbills/programs/pamphlets/fliers (chirashi/チラシ) in the Makino Collection, are an interesting source for research on Japanese film. They indicate what films were showing where and when, and may indicate cast and director/writer information. There is often a description of the film and advertisements. 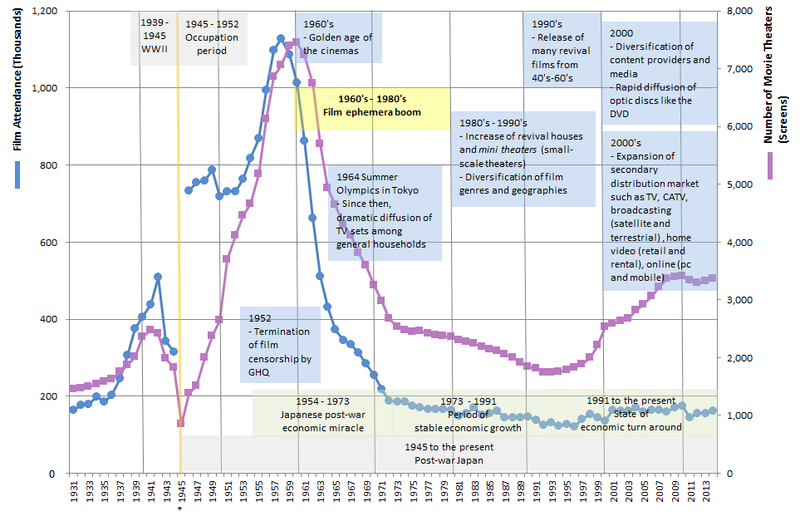 They enable scholars to find out what was popular at a certain time and location and the Makino Collection has a spectacular amount of these materials for both the pre and postwar periods. I recently added movie theater handbills/programs from China (including Manchuria) to the East Asian section of the Makino Collection (Series VII, box 609, 611, 634). 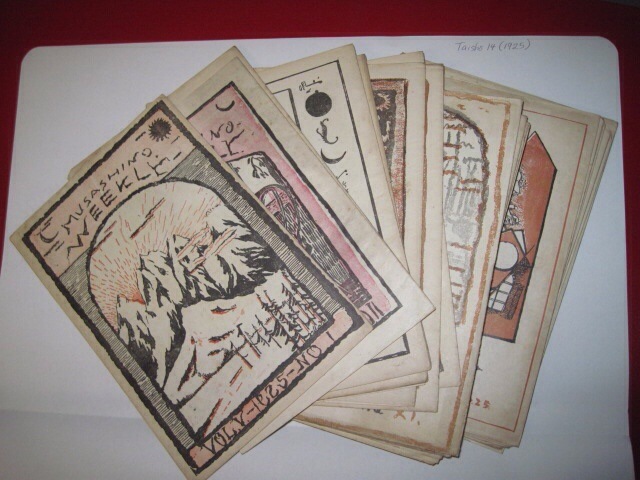 These handbills from the 1940s are organized by city in Manchuria, with dates in Manchukuo calendar years (kōtoku/康徳), assuming that is what was written on the handbills. Cities include Hsinking/Xinjing/新京 (capital of Manchukuo), Dairen/Dalian/大連, and Tianjin/天津. Some include tickets stubs which are kept with the handbill/program. Some have English, Japanese, and/or Chinese, and sometimes Russian text. What do these ephemera have to contribute to our knowledge of the colonial period and Japanese Occupation? Perhaps patrons of the Makino Collection will tell us in the future. These are Musashino Weekly from 1925. This set of handbills contains prewar fliers, pamphlets, programs, and weekly listings of film showings at movie theaters primarily during the prewar period. 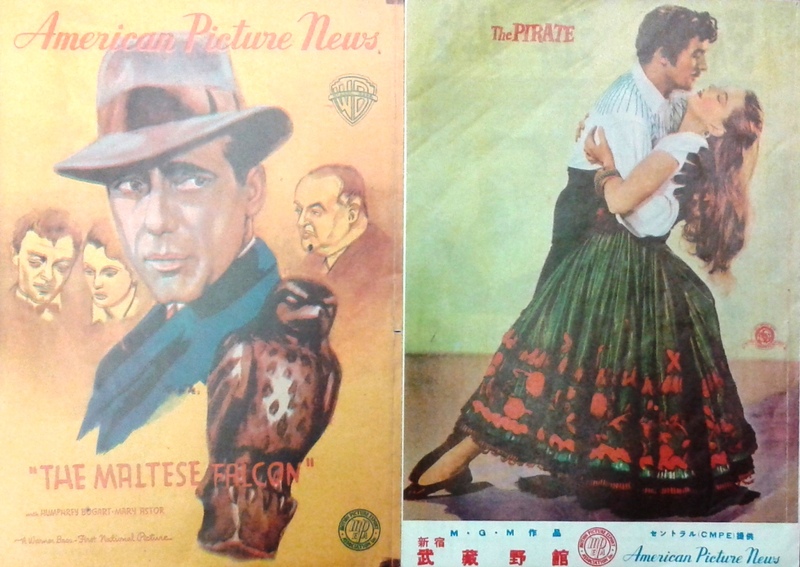 Also included with many of the programs are newspaper clippings or even ticket stubs for the particular film showings that appear in the programs. They are very well organized and we tried to include as much information as possible in the Excel file of holdings. 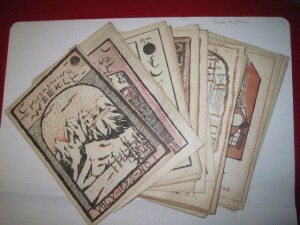 The first file contains early Meiji period handbills with some from the Taishō period (1920s) as organized by Mr. Makino. Files are then organized alphabetically by city, theater name, title (when known), and then number and date (This retains Mr. Makino’s organization by location and theater name). The majority of fliers are from theaters in Tokyo, more than 70 movie theaters in all. For these theaters, they are further organized alphabetically by location within the city of Tokyo: area of Tokyo, theater name, title, and then number and date. Some programs in this subseries are numbered and dated, while others are not numbered nor dated. The scope content/notes column includes the name of the film production company that managed the theater where known. In addition to the theater name, we have included the title of the publication, which means in some cases there are multiple folders per theater name. – handbills/programs distributed at multiple theaters and locations that were managed by the film production company Shōchiku. They were were kept in 2 files by Mr. Makino (we have kept them together as well, also in Series XII). – special film screening fliers/特別上映 and previews/試写会 (Series XII.14), which were kept in their original 2 file order. – music fliers for films, and postwar fliers from the 1980s collected by Kobayashi Keizaburō/小林圭三郎 (kept in Series I.6: Director Files, Kobayashi). 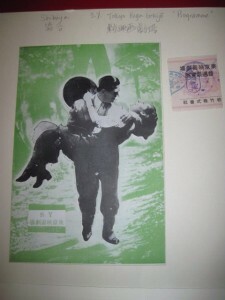 – movie theater labor dispute materials/労働争議資料, documents which concern movie theater personnel, but are also related to the production companies (also in Series XII). In addition to the items processed thus far, there are 26 boxes of unprocessed postwar film programs that remain in the Collection. 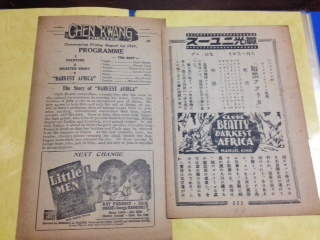 These complement the prewar movie theater handbills and offer a different perspective on film viewership in Japan. Some of these may contain fliers acquired along with the movie theater programs, which in the postwar are programs that were purchased by patrons rather than freely distributed by the movie theaters, and are thus souvenirs. This entry was posted in movie theater handbills and tagged East Asia, handbills, Manchuria, programs on November 21, 2013 by Beth Katzoff.